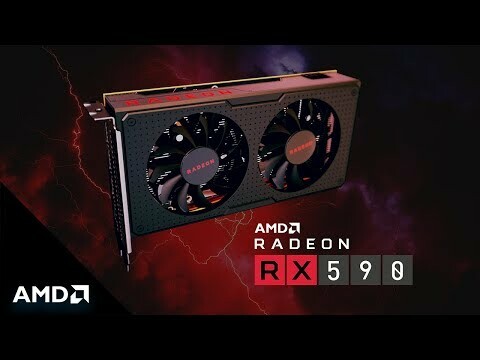 Sapphire RADEON RX 590 GPU SAPPHIRE Technology is proud to introduce a set of superior features for PC Gamers’ with the new SAPPHIRE NITRO+ Radeon RX 590 8GB Special Edition Graphics card. Designed to optimize performance and efficiency on FinFET 12nm process technology, the NITRO+ RX 590 8GB Special Edition comes equipped with the Award Winning SAPPHIRE Dual –X Cooler, and is capable of delivering a smooth and fast gaming experience at high resolutions. There is also a stylish RGB LED SAPPHIRE logo on the side which changes colour to indicate board temperature which can be easily controlled with SAPPHIRE TriXX software. EVEN BETTER PERFORMANCE Gamers will experience the advantages of APIs like DirectX® 12 and Vulkan® which have been optimized on AMD’s Radeon™ RX graphics platform in collaboration with many of the world’s top game developers and studios, to deliver unrivalled gaming performance and stunning lifelike imagery. Powered by “Polaris” Architecture Radeon™ the NITRO+ RX 590 8GB Special Edition features the 4th Gen GCN graphics cores, display engine and multimedia cores, all on FinFET 12 process technology. This has enabled SAPPHIRE to push up the clocks, and reach up to 10% better performance than the competition. Packed with 2304 GCN-based stream processors, the SAPPHIRE NITRO+ RX 590 8GB Special Edition is the card to deliver 1080p gaming and enhanced performance in everyday applications. Optimized for gaming performance The Dual-X cooling system on the NITRO+ RX 590 8GB Special Edition continues to push the performance boundaries beyond the default specification. When targeting the same GPU temperature of 75 degrees Celsius, the cooling system is up to 12 dbA quieter and with significantly lower component temperatures. The cooling system module has 2x 8 mm + 2x 6mm heat pipes, a larger heat dissipation surface of 54 fins and a NEW thermal grease producing 30% more thermal conductivity. All of these features cement SAPPHIRE’s Dual – X Cooler as the best in class system available on the market today. SAPPHIRE’s Intelligent Fan Control III system, increases the precision of the fan controller. The differences in RPMs from fan to fan have been brought down from 10% to 3.2%, increasing the cooler’s accuracy. 8GB Sapphire Radeon RX 590 NITRO+ Special Edition, 12nm, 2304 Streams, 1560MHz Boost, 8400MHz GDDR5, 2x DP/2x HDMI/DVI-D is rated 5.0 out of 5 by 2. Rated 5 out of 5 by Adamantois3 from excellent value Excellent performance considering the price. Paid substantially less than I would have for a gtx 1070 and performance is solid at 1440p in ask games. Obviously I tone down some of the ridiculous settings (looking at you Witcher 3 hair settings) to maintain good frame rates but got £250 I'm playing AAA titles with no issue. Only complaint is that it is a relatively high power component which I hadn't realised at first, ended up switching PSUs to compensate. Performance is actually on par with the "Fatboy" version a friend owns (likely due to the higher memory clock) without using up that third slot.